Crouse-Hinds Form F cord connector of trade size 3-inches, has standard neoprene seal. It features feraloy iron alloy construction with electro-galvanized and aluminum acrylic paint. Connector accommodates conductor of size 2.188 - 2.5-Inch and measures 3.75-Inch Dia x 2.625-Inch. 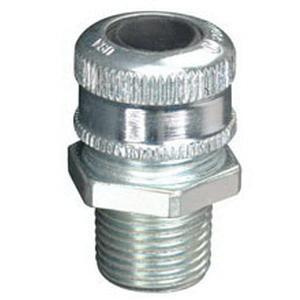 It has thread length of 1-Inch and withstands temperature rating of -25 to 40 deg C. Connector is cULus/UL listed and NEC certified.